Salator prayer in Islam is strictly regulated action. Is determined not only by the number and timing of prayers, but also the direction in which the believer should turn to Allah, clothing and other aspects. The features exist for certain categories of people, including girls. What are they? - clothing suitable for the requirements of Islam. Before prayer make wudoo'. By this term it is meant to wash the face, ears, neck, hands and feet. It should be noted that, according to many religious authorities, the ablution is not valid if the woman nails varnished. It must be pre-erased. In the absence of water allows so-called "ablution with sand." This ritual was designed for desert conditions, and Russia is usually not relevant. Wear clothes appropriate to the requirements of Islam. It should cover the whole body except the face and hands, and is not to be nor sculpture, neither too bright nor clear. Prayer in the mosque or at home. The second option is considered for women is more preferable, however, if the mosque has a special room for prayer women can be made a religious rite and there. For women as for men, the mandatory five-time prayer. For women you'll be the process of prayer. If a man during prayer when you pronounce the words "Allah Akbar," raises his hands up, the woman must keep the elbows pinned to the body. She should be more cautious in their movements. 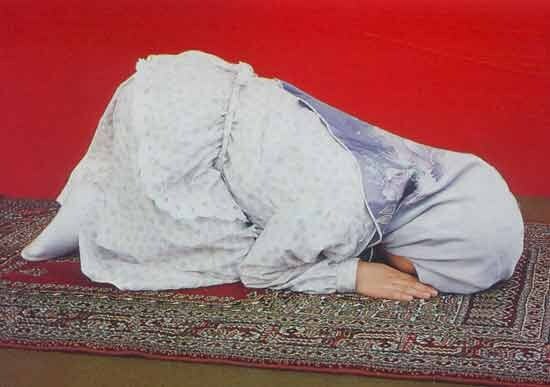 Also, when the prayer-Sana'a, the woman must to put the hands on the abdomen, as men, and on the chest. The specifics are for girls and committing prostration "Sajdah". The woman should squeeze the elbows to the body, and the body should be as close to the ground. Upon completion of this bow a woman sits on her knees, leaning on the thigh, not the leg like a man. At the same time, the text of the prayer for the girls and men are identical, specificity for only certain movements. The process of prayer can have their own specific traits in specific schools of Islam. Therefore, to obtain more complete information a woman should consult an Imam for its Muslim community.